VATICAN CITY (CNS) — Take care of your marriage and aging parents, play with your kids, and always make peace at the end of the day, Pope Francis told Vatican employees and their families. 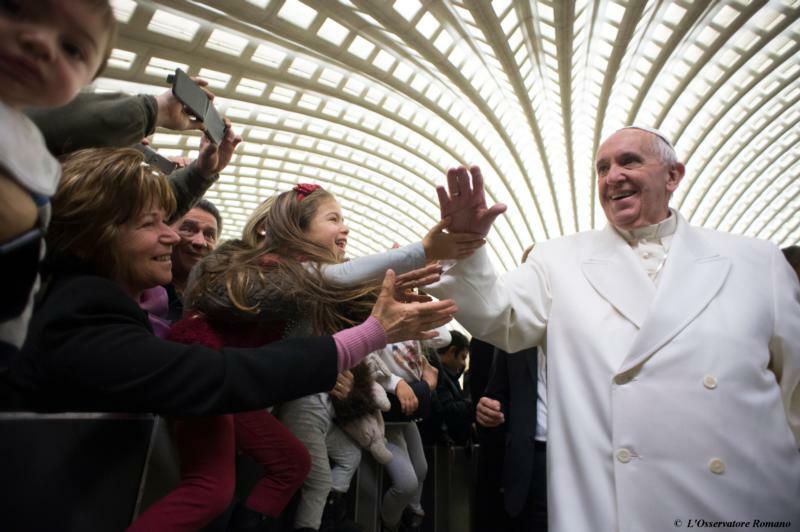 Try to live out the Year of Mercy every day in the hopes that everyone can “experience the joy of mercy, beginning with your families,” he said during a special audience in the Vatican’s Paul VI hall Dec. 21. The pope continued a tradition he started last year of inviting people who work at the Vatican, along with their family members and loved ones, to receive pre-Christmas greetings. The now-annual meeting follows a longer-held tradition of the pope meeting with members of the Roman Curia — the church’s central administrative offices — as well as cardinals living in Rome and members of the papal household. “And while I am thanking you, I want to also ask your forgiveness for the scandals there have been in the Vatican,” he said. A marriage “is like a plant. It’s not like a cabinet that you put over there, in a room, and dust it every now and then. It’s a living plant, it has to be taken care of every day,” he said. “Talk to your kids, listen to them, ask them what they think” and play with them. “Dialogue between parents and children is very healthy,” he added. “Let’s take care of grandparents. Grandparents are so important for families,” especially because of the memories they hold from the past and the wisdom they possess. “Don’t set them aside,” he urged. “It’s necessary to learn this wisdom of making peace” right away and not let it linger, he said. “Have you waged war during the day? Is this war still smoldering? Don’t let it become cold because a ‘cold war’ the day after is more dangerous than a ‘hot war.’ Got it? Always make peace at night,” he said.